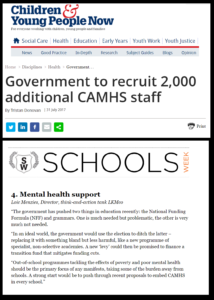 We welcome yesterday’s announcement that the government will recruit 2,000 extra CAMHS (Child and Adolescent Mental Health Service) staff, in line with our top “election wish” reported in Schools Week in April this year. 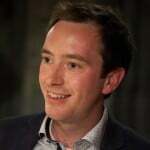 As Director Loic Menzies argued at the time, external services need to take some of the weight off over-stretched teachers and schools whilst ensuring that the current dearth of support for youth mental-health is tackled. We are delighted that the government has now acted on our suggestion. Nonetheless, we remain concerned that according to Mark Bush of Young Minds speaking to Children and Young People Now “even with the extra money that’s been promised, NHS England have said that they will only be able to reach one in three children with a diagnosable mental health condition”. Our forthcoming report on youth homelessness will make it clear that improved access to mental health provision is a pre-requisite for stemming the rising tide of youth homelessness, it was also a key area highlighted in one of our Social Mobility Commission reports earlier this year.